Porcelain veneers are a popular cosmetic option for those who want to perfect their smile in as little time as possible. 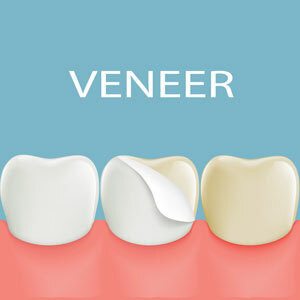 Veneers are made from a thin porcelain or composite material that mimics the appearance of teeth, with each set being individually-crafted to match a patient’s tooth shape, size, and colour. They are then bonded over the front of the patient’s teeth, instantly boosting the appearance of their smile. During the initial consultation, Dr Teena will obtain a more comprehensive overview of your mouth through taking intra and extra oral photographs. She also likes to produce veneer mock-ups so each patient can gain a clearer idea of how their veneers will look. When a patient is happy to move forward with treatment and their consent has been granted, Dr Teena moves onto the veneer preparation stage, along with fitting the patient with temporary veneers so they can get used to the look and feel of the treatment. Once the permanent veneers are back from the lab, Dr Teena fits these into the patient’s mouth and makes sure that the results are according to the patient’s expectations . In some cases, a patient may experience jaw-clenching or concerns with their new bite, so we’re able to provide a splint to counteract these issues. As with any cosmetic dentistry, veneers require an appropriate level of care, so Dr Teena gives each patient thorough and actionable instructions for looking after their new veneers or crowns . If you’re tired of crooked, discoloured, or uneven teeth and think veneers can be the treatment of choice for you, schedule a free consultation with Rouse Hill Smiles today.